Yesterday, something happened in our neighborhood that got more personal as the day wore on. It became almost surreal. On our way to school in the morning, just before 8:00am, my daughter and I were passed by a fleet of emergency vehicles. While most of them flew past us when we pulled over to the right, one police car turned left onto a side street directly across from us. We noticed he joined another police car and two police motorcycles. When he stopped we saw that they were already arresting a man in the street, right in front of the houses. We had a pretty clear view of what was going on. The man was wearing jeans and a white teeshirt and it was garbage day so I could tell he wasn’t that tall when compared to a trash can. It was definitely a lot to take in in the brief time before traffic started moving again. We could see that the rest of the action was just beyond her school. There was an ambulance and fire truck, as well as a couple more police cars. I continued into the school driveway and assured her that if I saw anything significant, either when I drove by or on the news, I would text her. She still had 20 minutes before school started so I wouldn’t be interrupting her day. Of course she was curious; she’s 12 and this was some pretty big goings on for our town. And she got to see part of it first hand! So after our usual, “I love you,” and, “I’ll see you after school,” I continued driving past the second pack of emergency vehicles. There was a black SUV parked in the right lane of traffic, opposite the direction I was headed, and a civilian and an officer directing traffic around that lane. I could see other officers putting up caution tape on a broken part of a fence just off the sidewalk at that spot. We have a canal that runs through our neighborhood, as well as a golf course there. There’s a turn in the road at that spot, and while it’s not very sharp, sadly a car taking it too fast would not be the first to end up in the canal. Assuming that’s what happened, I texted my daughter what I saw when I was home, and set about my morning routine. After a little while, my head started nagging me that if it was a speeding car into the canal, what did that have to do with the arrest a few blocks away? So I looked at a local “news” Facebook site that I generally discount because it’s mostly gossip. Of course the gossipy, judgy comments were there but the meat of the story was too. The speeding car hit a pedestrian, continued driving onto the golf course, abandoned his car then was arrested a few blocks away. Wow! Some morning! But it just continued. Shortly after that, I learned that he not only hit the pedestrian but also killed the pedestrian and the road would be closed while the police conducted their investigation. Since that road is the main artery through town, I decided to sit tight on my errands. I had enough friends asking what was going on that I decided to take my dog for a walk to the park nearby and see what I can see. This was around 11:00am. It was eerily quiet. I don’t think I’ve ever been on that road without traffic, even walking at night. 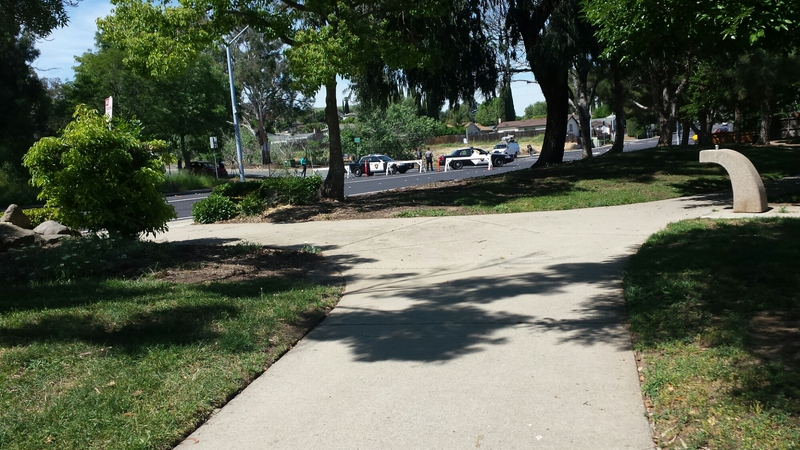 There was another lady walking her baby and we were talking, wondering if they’d even let us into the park because it was just past where they were turning cars around, even though it was on the other side of the street from.thr investigation. They did let us by and there were other people there. We walked the length of the park like we normally do, didn’t see much but detectives doing their thing, then came home. When I got home I saw that my brother made a comment about my uncle walking that area frequently. He lives on the street where we saw the arrest and he actually made a hobby of walking golf courses and picking up balls. It was something I knew but it hadn’t occurred to me to check on him until then. So I called to make sure he was OK. I was relieved when he answered the phone and he made me laugh when he assured me he was at the golf course in a neighboring town that morning. Whew! Not too much time passed before I started to get antsy again and decided I would leave our neighborhood the other direction and go grocery shopping. While I was in the store, I received a call from my daughter’s school. It was a recorded call from the office explaining that some kids walking to school in the morning saw the accident and it was graphic. The school wanted parents to know that they brought extra couselors in and they would be available to students. Yup, I just about lost it right there in Costco. On the gossipy news site I was able to discount the adults posting what they thought they saw. But the idea of a child on his way to school seeing such horrific things all but brought me to my knees. I will spare you the description but I will share with you that the body was not in one piece. I had to collect myself. I had completely forgotten that right before the phone call, my biggest concern was how do I go pee without having all the stuff in my cart get put away? I wanted to be home. I wanted it to be 3:00 and I wanted my babies in my house with me. I got home, got the food put away and it was only 1:45. On my way home I double checked that the road was still closed. My daughter texted me right before her last class asking if she could walk home. I told her I really didn’t think she had a choice, just be safe. Then I thought about it. There are no cars on the road because it’s closed and it’s crawling with cops. Yup, she’ll be safe all right. Then I texted my son explaining that the road was closed and I’d have to take the freeway to pick him up. Pretty much a don’t rush because I’ll be there when I get there message. Luckily, they opened the road shortly after my daughter’s school got out. I was able to take it to pick my son up. Since he missed all the morning’s drama, I caught him up on the drive. When I arrived home, my daughter told my about a friend of hers who saw the accident. She said the friend didn’t say, “I saw it!” in a loud, boastful way but in a quiet, sad, withdrawn way. That’s what struck my daughter the hardest. My heart just breaks for these kids. Our evening went on as normal and as we were watching TV, I got a text from my cousin. The pedestrian was the mother of one of our high school classmates. She lived a stone’s throw from the uncle I called to check on earlier in the day. She walked that route twice a day, everyday. She was a mom, in my neighborhood, walking the same area I walk my dogs, the same area my daughter walks to school. And yesterday an officer had to stand on her porch and explain to her husband that she’s not coming home because someone couldn’t obey a speed limit (I will not form an opinion on what may or may not have been in his system to modify his judgment). If that isn’t a pure example of selfishness, I don’tknow what is. When terrorists attack, we say, “If they change our way of life, they win.” But is that the case here? No one “wins.” Fast drivers don’t win. I don’t want to walk my dog. I don’t want my daughter walking home. I don’t want to live in fear but just for a minute, I do. I want my family safe. I want to put then in a bubble. I want everything to just s I o w d o w n. Maybe that’s not the meaning of the fable the Tortoise and the Hare, but I’ve gone into mama bear mode and I need to protect my cubs right now. And right now, our neck of the woods feels like a dangerous place to be so we’re going to have to stay a little closer to the den.